Our learning was supported with excellent lectures and practical sessions. Why did you choose the course, and what did you want to gain from it? 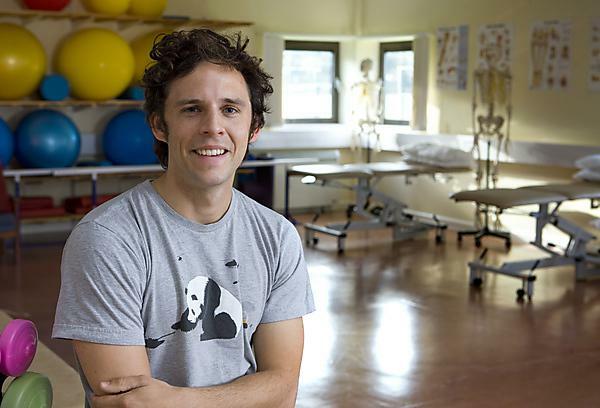 I chose Physiotherapy because I am a sociable person and enjoy working with people. I felt that it was important to study a vocational course because I was a mature student and wanted to come out of university with a profession. I had done quite a bit of work experience and the autonomy that physiotherapists had in their practice really appealed to me. I find the human body fascinating and loved that fact that everything I learnt could be related to my own body. What are your views on the placement element of your course? The course followed a Problem Based Learning (PBL) structure, which I really responded to and enjoyed. With PBL you are given a case study to discuss in small groups and create learning objectives. You split up the workload within your PBL group and then feed the answers back at the end of each week. The lecturers made it clear to us that we weren’t in competition with each other and that if everyone got a high enough mark then everyone could achieve a 1st class degree. This meant that there was a really supportive atmosphere amongst the students with everyone helping each other when they could. Our learning was supported with excellent lectures and practical sessions but, with the PBL structure, the main emphasis was on us to learn the course content rather than being spoon fed. There was a great sense of camaraderie on the course, especially when we started placements and could share experiences and tips with each other. Placement supervisors were always aware of our current stage of learning and would ease us into things slowly. Before we knew it we were assessing and treating patients without batting an eyelid! What are the good and bad bits of the course? If there was anything negative how did you overcome this? In my first year of study I sometimes found myself wondering if I’d ever be able to do the job because there seemed like so much to learn. Happily, these worries were unfounded because the teaching and support on the course were fantastic! There was a steep learning curve to the practical skills but we had lots of time to practice on each other. At first being in a room filled with people wandering around in their underwear felt a bit odd, but we got used to this quickly and people’s inhibitions faded rapidly. I currently work as a Research Physiotherapist at the Institute of Neurology, University College London, and the National Hospital for Neurology and Neurosurgery. I am involved in a project that is exploring the effect of a home exercise programme on walking endurance in people with Charcot-Marie-Tooth disease. I do all of the day to day running of the project such as keeping a master file and recruiting participants but also go to the participants homes and teach them the exercises. In addition, I attend clinic twice a week with Dr Reilly, who is the consultant neurologist who specialises in hereditary neuromuscular diseases at the National Hospital for Neurology and Neurosurgery. I recently had the opportunity to go to the international Charcot-Marie-Tooth conference in Antwerp (all expenses paid) and present a poster, which was an amazing experience. Is there any advice you would give to anyone interested in a health course? The course is quite intense because you are basically fitting your placements in around a full time degree but the workload was manageable and very rewarding.